Lt. Gov. David Dewhurst opposes the DREAM Act, and former Texas Solicitor General Ted Cruz doesn't support amnesty. Yet after the back-and-forth between the rival U.S. Senate campaigns, some voters could be left wondering. "The federal government has failed to secure our borders, and David Dewhurst believes we need to implement serious measures to help halt illegal immigration, including E-Verify. David believes we should also continue to enhance and improve programs like E-Verify, which ultimately help enforce our nation's immigration laws." For all the attacks the Republicans running for U.S. Senate in Texas have lobbed at each other on illegal immigration, they agree on many aspects of the volatile issue. Both Lt. Gov. 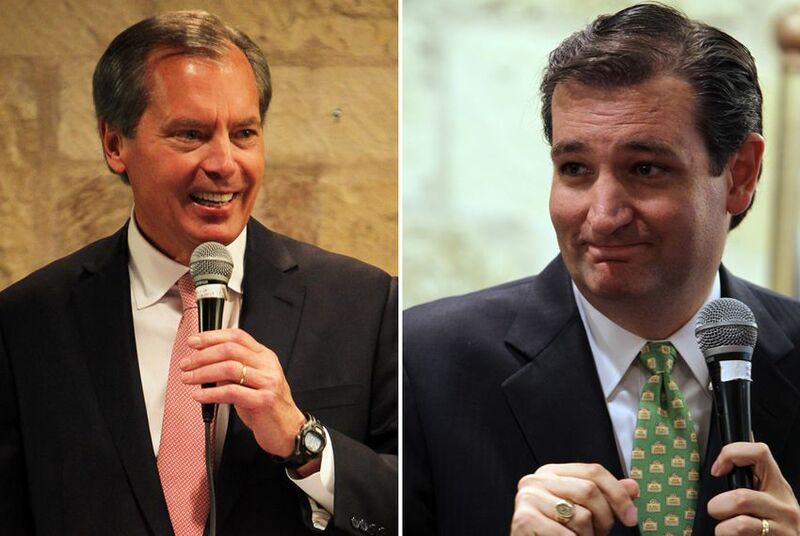 David Dewhurst and former Texas Solicitor General Ted Cruz say they oppose the DREAM Act and any forms of amnesty. They not only agree on doing more to protect the border; they both want to expand the U.S. Border Patrol by the same amount. “If elected, the first thing I will do is triple the U.S. Border Patrol,” Cruz said in an interview with HotAir.com last month. “For years, I’ve been recommending we triple the size of our Border Patrol and once and for all secure our borders,” Dewhurst said last week in Kerrville. Despite the campaigns’ common ground, immigration has emerged as a key issue in the race, and attacks from the campaigns appear to have left some voters confused on where the candidates actually stand. B.J. Grayson of Kerrville voted for Dewhurst in the primary but said last week that she plans to support Cruz in the runoff. Huckabee, who has endorsed Dewhurst, has long expressed support for a proposal like the DREAM Act, a federal initiative that would provide a path to legal status for many immigrants who have graduated from high school and have earned some college credit or served in the military. Dewhurst has repeatedly said he does not support the DREAM Act. Yet Cruz’s campaign has accused Dewhurst of backing the Texas policy of granting in-state tuition rates to some illegal immigrants attending public universities, which has been referred to as the Texas DREAM Act. The measure became law before Dewhurst was elected lieutenant governor. Dewhurst has said he opposes it but never pushed for the Legislature to repeal it because the votes weren’t there. Cruz, who opposes amnesty for immigrants already in the country illegally, has found himself on the defensive on the issue recently. Days before the May 29 primary, Dewhurst released an ad strongly implying that Cruz favors amnesty by claiming that Cruz helps run two pro-amnesty Hispanic groups. One of the groups said Cruz never held a leadership position with it. The other insisted it doesn’t support amnesty, though at least one board member disagreed. Cruz denounced the ad as a fabrication, yet it has appeared to have had an impact on some voters. Ann Couslin of Kerrville said last week that she supports Dewhurst and that the choice wasn’t difficult. Amid the back-and-forth from the campaigns, the immigration proposals the candidates actually disagree on have drawn less attention. The Republican Party of Texas recently revised its party platform to include support for a national guest-worker program. Cruz said he opposes such programs. Dewhurst has expressed support for such a program in the past, but spokesman Matt Hirsch said Tuesday that Dewhurst would not back any program that allows a path to citizenship. Cruz supports building a wall along the entire U.S.-Mexico border. Dewhurst has said he supports building a wall only along certain stretches of the border. Cruz has said he supports mandating that businesses use E-Verify, an electronic program that verifies whether someone is allowed to legally work in the U.S. Dewhurst’s campaign declined to offer his position on that issue.